Billy Strings have announced their Spring 2018 dates. The tour will take the band throughout the Southeast, into the Midwest, and as far west as Las Vegas. The band will be making stops at legendary festivals like Suwannee Spring Reunion in Live Oak, Florida, Bender Jamboree in Las Vegas, Old Settlers Fest in Dale, TX, and Telluride Bluegrass Festival in Telluride, CO. Stay up to date on all things Billy Strings at billystrings.com. Turmoil & Tinfoil debuted at #3 on the Billboard bluegrass charts, continues to have a seat on the bluegrass radio charts and has received much critical acclaim since its Fall 2017 release. Billy Strings (solo) will join I’m With Her for a handful of shows on the East Coast this coming February. For up to date information and to purchase tickets go to billystrings.com. 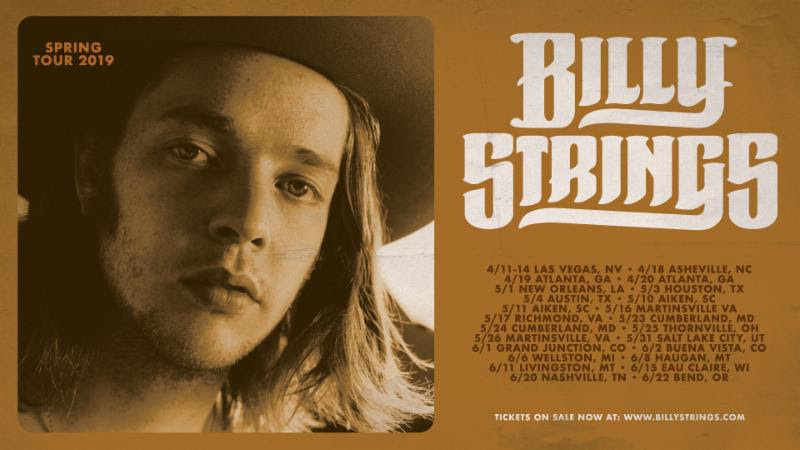 NASHVILLE, TN – Billy Strings is has to announced several tour stops for Spring, 2019. In addition to a heavy touring schedule, Billy has added stops across the country that have him appearing at several iconic festivals and venues along the way. New additions include Bluegrass Bender, Sweetwater 420 Fest, Aiken Bluegrass Festival, DelFest, Dark Star Jubilee, Roosterwalk, Camp Out For The Cause, Camp Greensky, and many more including a co-bill performance at the legendary Ryman Auditorium in Nashville w/ Steep Canyon Rangers. The tricky part of making the new album, Turmoil & Tinfoil, was translating BillyStrings’ incendiary live show into the studio. Returning to his home state of Michigan, Billy enlisted acoustic roots wizard Glenn Brown (Greensky Bluegrass) as producer, and centered the music around his new band, featuring Drew Matulich on mandolin with banjo prodigy Billy Failing and much-loved Nashville bassist Brad Tucker. Rich with special guests, Turmoil & Tinfoil shows off Billy’s East Nashville community of picking friends, among them Miss Tess, Molly Tuttle, John Mailander, Shad Cobb and Peter Madcat Ruth. Of special note is a virtuosic duet between Billy and bluegrass guitarist Bryan Sutton on “Salty Sheep” that shows the speed, precision, and creative craftsmanship of bluegrass when it’s done right.